One clear example of Malala harnessing the power of stories to build support for her work is her Nobel Peace Prize acceptance speech, in which Malala addressed dignitaries and distinguished guests from around the world, as well as the millions who would be able to watch her speech on TV and on the Internet. In her 26-minute long acceptance speech, Malala masterfully spoke to her audience about the problem of girls being denied an education and why it is so important to solve this problem. 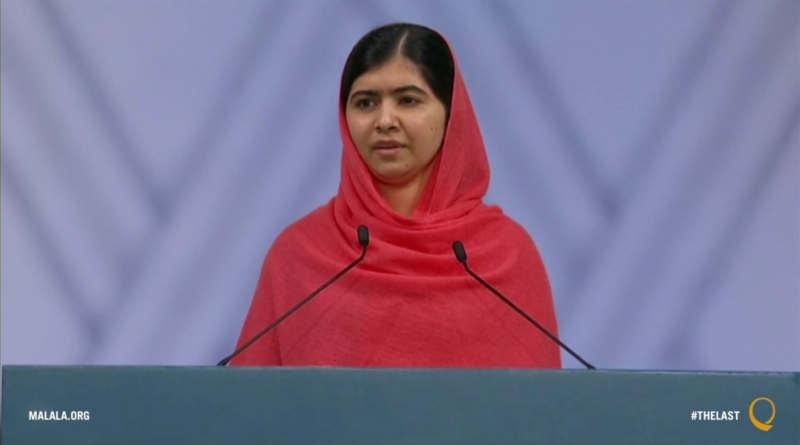 She then spoke about how the Taliban attacked her and her friends, an attack that nearly cost Malala her life, and how that has motivated her and her friends even more to speak up against those forces that would keep girls from getting an education. Malala then transitioned from telling her story to telling the story of other girls – ones that were sitting in the audience – who have faced similar challenges in getting their education. She spoke about her two friends – Shazia and Kainat – who were with her on the school bus that was attacked by the Taliban. She spoke about another friend from Swat—Kainat Soomro—who suffered violence and whose brother was killed, but who still went to school despite the risk. She spoke about 16-year old Mezon, one of the 1.4 million Syrian refugees living in Jordan, who “goes from tent to tent encouraging girls and boys to learn.” And she spoke about Amina, who comes from the region of Nigeria where Boko Haram preys on girls trying to go to school. Though she only mentioned them briefly, she captured the essence of each of these girls’ stories. She continues the rest of her speech by calling on world leaders – some in the room and some not – to act now to end this problem and ensure that no girl, no child, is without quality education. At the time of writing this blog, more than 1 million people have watched the video of Malala’s speech on YouTube, and countless others have read the news coverage or watched clips of her speech. 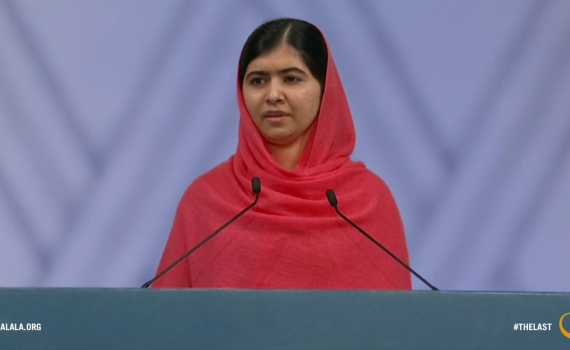 This speech is just one small part of her larger work around the world to address the issue of girls’ education. And harnessing the power of stories is as integral a part in her larger campaign, The Malala Fund, as it is in this speech. The Malala Fund’s advocacy work and public campaigns are also steeped in story. So why does Malala tell these stories? How would telling her story and the stories of other girls help her raise awareness and support for girls’ education? Stories, as I wrote a few weeks ago, provide a lens to understand problems in life in a safe way, without the emotional and tangible fallout that occurs in real life. Stories allow us to understand or connect to a situation that we may not have experienced ourselves. As Malala said in her speech, 66 million girls are deprived of an education. This is a massive global problem, requiring multi-layered, complex solutions to meet the various contexts in which this problem occurs. The story of 66 million girls is so large, so abstract, that it is extremely difficult to picture what this problem really looks like in the world. And because of that, it is more challenging to get people who have not experienced this issue themselves to commit to helping to end this problem. But one girl’s story – one person whom an audience can connect with through his or her experiences – can help an audience understand this much larger problem. And this way of understanding a problem through the lens of a person’s story that the audience connects with, that can picture and empathize with, compels the audience to action. Malala’s own story is not ordinary, at least not anymore. But her story and the stories of those other girls struggling to get an education give those who have not experienced this struggle themselves the ability to understand a global problem affecting 66 million young people.